A Daily Dose of Fit: Lance Armstrong...and beer?! This is the very last page of my current Women's Health magazine. 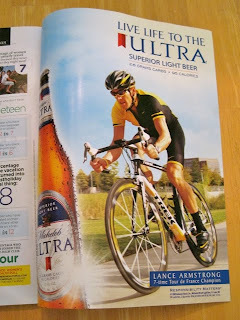 It's an advertisement for Michelob Ultra that features cycling champ Lance Armstrong. I've seen this ad before, even on the side of a bus stop in Chicago. And I'm sure you've seen it somewhere, too. From the same press release, I quote Lance's own words: "I'm always making decisions that complement my active lifestyle, and this includes my beer choice when I want to enjoy a cold one with friends or when taking a break from training." And I respect what he says. It's responsible, and it doesn't necessarily indicate that he parties hardy. Or does it? Does his statement leave room for individual interpretation? On one hand, I think Michelob Ultra and Lance Armstrong are handling the message correctly. Healthy guy drinks light beer responsibly. But that's just me and I can't help but wonder if other people will draw more of a Lance-is-healthy-so-it-must-be-healthy message out of the campaign. See the difference? So I'm torn between accepting it and feeling bothered by it all. That is a tough one. Though he is "real" and that's what I like, I don't think he needs to make money promoting it as an option for a healthy lifestyle. And I love Lance! But this goes hand in hand with Olympic athletes, too, saying their snack of choice is a snickers bar. Remember those campaigns? To that I say "Really? During a break between gold medal rounds you have candy?" I just keep hoping that 100% of profits are going toward the Livestrong Foundation. Then I'd be all fine with it. I think.